Practice your salon skills in a student-run salon. Essential Question: What makes an exceptional client experience in a salon? Amount of credit earned: Group ELO embedded in a 2-year program earning two credits per year. Community Partners: Advisory board composed of area salon owners and stylists, customers receiving services, and postsecondary schools. Manicure/Pedicure – understand basic nail theory and provide basic nail care services. Facial – understand basic skin care theory and provide services. 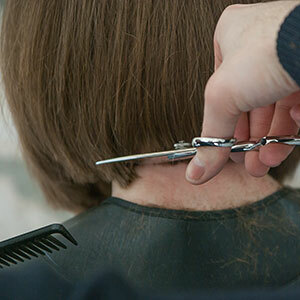 Haircutting – theory and practical of hair cutting techniques. Clinic/business – fundamental concepts of entrepreneurship. Participate in student-run salon once a week. Welcome customers at reception desk. Take payment at reception desk and book next appointments. Perform the day-end cash drawer procedure and other management duties. Students are observed a minimum of three times for their interactions with guests, from the reception desk intake, throughout the entire service, and the client checkout process. Students complete the client intake record card, and are assessed on how well they complete their consultation with their client. They get supervisor agreement before proceeding with the client service. The student’s goal is to complete the service correctly without redirection. To do this within the school you must have a CTE cosmetology program that is approved by the Cosmetology State Board through the state of New Hampshire. Instructors must have a cosmetology license to be able to teach cosmetology in the state at both the high school level and at postsecondary schools.